Tout Wars Head To Head, Origins! | TOUT WARS! Tout Wars Head To Head, Origins! Going into this year, for most of Tout Wars’ 18-year history, I played in Tout Wars NL. This was my NL home league, and while each year a face or two might change, there was great continuity and camaraderie. 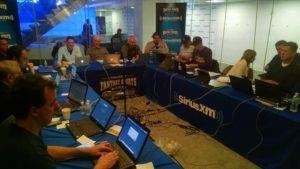 So it felt odd, this past Sunday, to be sitting outside the Fishbowl at SiriusXM in NYC, watching reigning champ Mike Gianella and three-time champ Tristan Cockcroft and tw0-time champ Scott Wilderman and one-time champs Brian Walton and Steve Gardner and half-champ Lenny Melnick (with Irwin Zwilling), setting NL-only benchmark roto prices while putting their teams together. How did this happen? It happened because this year I chose to play in the brand new Tout Wars Head To Head League. There were a few reasons for this. Let me count the ways (in no particular order). I invented the league. H2H started out as a version of Tout X, which the TOUT LLC had seen as a league with different formats each year, this year with Head to Head and an array of sabermetric categories (including fielding). But as I talked to the Touts who played in last year’s Tout X, their enthusiasm for odd formats they would have to do lots of extra prep for was muted. They wanted to play in Tout Wars, but they wanted to be able to write about the experiences that their audiences shared. It made sense to make a new league with permanent rules that Touts could rely on from year to year. I had never played Head to Head before. I read up on things, got lots of helps from Touts, especially Craig Mish and Jake Ciely, who critiqued various ideas I had from their practical perspective. Their enthusiasm for the project got me excited about playing in this traditional-enough but innovative H2H league. The spark came when Stacie Stern, a new Tout recruit, said she couldn’t come to New York this year for Tout Weekend because of family things, but would love to play in the Mixed Online Draft. I knew that Grey Albright wished to play in the NL only league. There was an opening in Head to Head. We rotated, done. 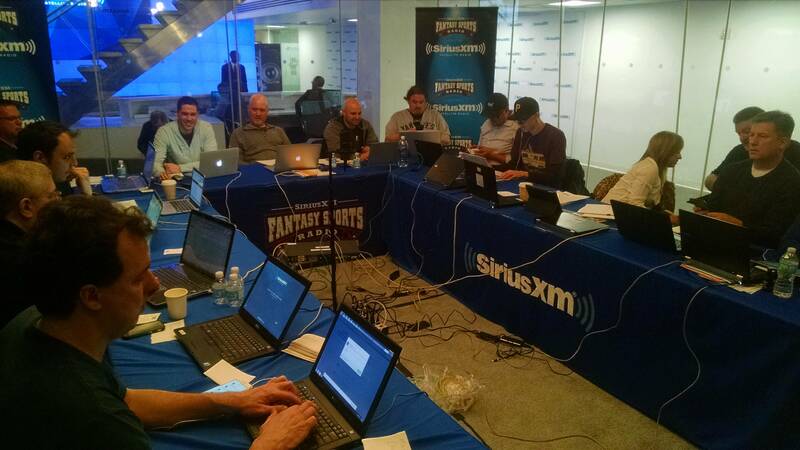 As it came together we ended up with a fantastic roster of fantasy baseball analysts. You can read their names here. It’s a swell group. Who wouldn’t want to play with these personalities? I can’t really speak to traditional Head to Head leagues, because I can’t say what traditional means, but the basic idea is that two fantasy teams face off for a day or a week and battle for either points or categories. 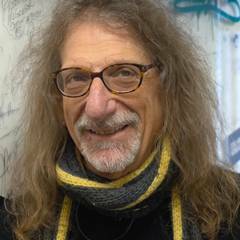 The one who has the most scores a Win. The one with the least earns a Loss. Categories, because in Tout Wars we play with Categories. That’s the way of roto, and it’s our way. For now, at least. 5×5, because we wanted winners, not ties. OBP, because it better values the range of hitting skills than BA. 12 teams means each team would play the other teams twice, for a total of 22 games. That seemed like an unsatisfying number, so I came up with multipliers. (I didn’t invent this, I don’t think, it evolved out of suggestions elsewhere.) Each of the 22 periods would be worth six games, two for hitting, two for pitching and two for overall. The team that won the most categories in hitting would earn two wins, the other team would loss two games. Same for pitching and for overall points. In case of a tie the teams would split the two wins. This left us with 132 (22 periods x 6 wins/losses) games on the season. K/9, because Jake and Craig said my initial suggestion, K-BB, would so favor starters that relievers would have no value. I could see this was true. QS+W, because, well, I’m not sure. I think so that Starters would have real value based on their ability to earn a QS, less random than putting up a W, plus Wins (from starters and relievers both) are in play, since the real game is all about who comes out on top. Roto periods, because no matter how I gamed various groups of categories I couldn’t get past arguments that favored going all Starters or all Relievers, at least in any given week, and while I could see how that might be fun, it was also a little too weird. One of the reasons I had never played Head to Head before, or taken it that seriously. Having first half/second half/overall Roto standings in our 10 categories translate into 12 Wins or Losses each meant that 36 of 168 total Wins or Losses for each team would be Head to Head. Enough to reward teams that both win the weekly contests and play it straighter, rather than win the weeklies by solely focusing on three hitting and three pitching categories. We’ll see if we got the right balance, but I’m pretty sure the results as September winds down will be exciting. 168 Wins or Losses total, because that’s similar to a regular baseball season. Will it take 100 wins to take the title, the way it does in the majors? Or will the best team win 130? Right now we don’t know. No playoffs, because they’re a fun and somewhat random way to end a H2H season, and we don’t want Tout Wars to be too random. Net Saves and Steals, because we wanted to try these categories out. Many would like us to adopt them in the other Tout leagues, but I’ve always been opposed. I have argued that the Saves and Steals cats are not just about skills. They are also about roles. A team’s closer has value because he’s a trusted pitcher who should be effective and because he should get saves. Other pitchers in the bullpen can be just as good, but for fantasy purposes we value the guy earning saves more. Similarly, Steals is a proxy for speed, a way to give guys who don’t hit homers but can run value. On the other hand, we also should value effectiveness, and using the Net Saves and Steals does give a truer measure of that. So we try them out here. Not Saves plus Holds, because we wanted to value true closers, and frankly because I thought that would give too much value to too many relievers with high strike0ut rates. The prices paid in Friday night’s TW H2H auction, however, surprised me. Starters with good strikeout rates went much higher than I expected, and they took those extra dollars from closers with even higher strikeout rates. This was at least partly in response to the minimum innings rule. Minimum innings, because we don’t want teams dumping starting pitching. Having to put up 475 innings pitched in the first 13 weeks and a similar number in the second 13 weeks, and 950 overall, means that you need 36.5 innings per week. That’s roughly four per pitcher, not onerous at all, but innings management is going to be important given the use of K/9. Transactions once a week, because we didn’t want to encourage streaming starters by opening a second transaction period on Friday. Jake argued enthusiastically that Friday transactions allow teams to use their bench to reset, to try to offset bad things that might have happened earlier in the week. I can see how this might be a good thing, but we decided to follow the regular Tout Wars transaction rules, which allow free ups and downs on Mondays, and midweek moves to reserve guys who go on the DL or are sent to the minors during the week. We’ll see how the season works out. I know it will be fun to follow Mike Trout and Paul Goldschmidt, at least until something horrible happens. And I I’ll publish have published my team post mortem with all the others over at blog.askrotoman.com, then manage like a demon. Previous Previous post: THIS is Tout Weekend! Next Next post: The First Tout Wars Head 2 Head Auction March 18, 2016! Read the Live Blog Archive and Spreadsheet.